Bandits Spurs is a costumer, model, and artist based out of Montreal, Quebec. Bandits has been crafting cosplays and props since she first discovered the hobby in 2013. 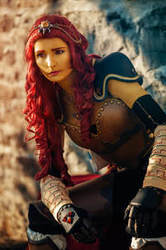 Her adventures in costuming started from humble beginnings; using a hand-me-down sewing machine while she worked on creating her first costume from items pieced together and modified from second-hand stores. After a few years of experience and experimenting Bandits now creates numerous costumes from scratch on a yearly basis, loving every moment of it. One of her favorite aspects of the cosplay hobby is the liberty to explore your own creativity and ingenuity; with every new project there comes an array of new opportunities to experiment with a new technique, develop a new skill, or figure out how to use unconventional materials to your advantage! Her mantra "You'll never know, until you try", get out there and craft your hearts out!